The Stinkwood Trail will take you about 45 min to complete and is 1.5 km long. It is a mild circular route through the forest between Skeleton and Window Gorges, where the largest and oldest trees on the estate can be found. It starts and ends at the Fragrance Garden. On this trail you can seen the three surviving Calodendrum capense (Cape chestnut) from an avenue of 92 of them planted in 1914 along the path from the ruins of the old homestead (where the Marquee Lawn and Lecture Hall are today) to the ruins of the woodcutters house. A line of stones across the path a short way past the third Cape chestnut, is all that remains of the woodcutters house built by the Dutch East India Company in the 1700s. Just before the path reaches the lower contour path, it passes through an area called donkergat, meaning dark hole, which is a good description of this deep, dark forest, but actually refers to a large circular depression nearby. 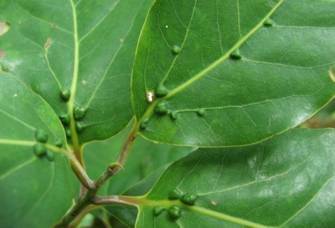 Ocotea bullata, the stinkwood, is not an easy tree to spot in the forest. Like all our timber trees, all large specimens were felled in the 1600s and 1700s. Today it is a protected species that may not be cut, disturbed, damaged or destroyed. The easiest way to identify a stinkwood is by the characteristic bumps (bullae) either side of the vein at the base of the leaves – if you can find any leaves in reach.